The cairn is on private land but it is accessible from the footpath that leads below Wigber Low, it only being a very short uphill uninterrupted walk from the path. From the B5035 Wirksworth - Ashbourne road turn north at the junction by the school in Kniveton. Keeping heading north to the crossroads of the road you're on and Standlow Lane, after the turning west onto Longrose Lane, it is possible to park here, SK209 511. Now follow Standlow Lane, a bridleway, west toward Longrose Farm. The Bridleway turns north before the farm, there is a footpath that runs through the farm but this is not the one you want. After crossing several fields Wigber Low, the hill, is the easily seen high point to your right or east. The impressive low spread of stones and kerbing that occupies the narrow ridge of Wigber Low is all that is visible of a small area that contains so much history. The finds of artefacts dating to the Middle Neolithic show that at this time the area was settled for the first time. Then in the Later Neolithic an excarnation platform occupied the spot we see the cairn today. Such a platform was used to lay out the dead on and for the bodies to be stripped of their flesh by carrion and exposure to the natural elements. It was the number of small bone finds, such as those of the fingers and toes, in the crevices of the bedrock that suggestd this purpose. The cairn of stones we see now started in the Bronze Age, several burials from this date were recorded during the excavations in the 1980's. These modern excavations were undertaken in an emergency when it was found that Anglo-Saxon burials had also been inserted into the cairn. High class metalwork including swords, daggers, spearheads and coins were recorded. 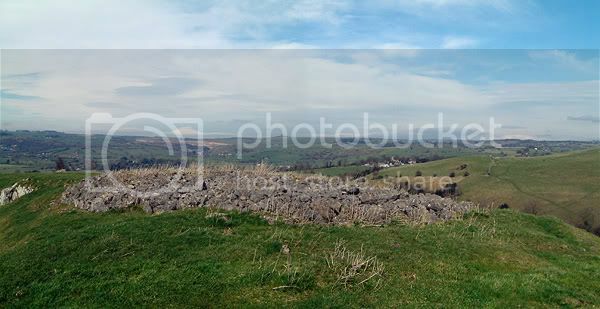 There are excellent views out over the limestone plateau with Minninglow to the north and Dovedale to the west.